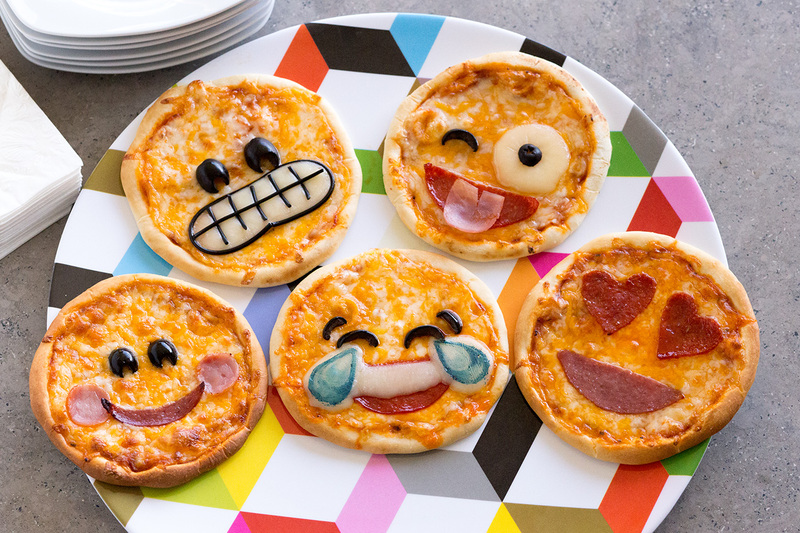 Be the hit of the day with these fun Emoji Pizzas! Spray counter lightly with cooking spray. Flatten desired number of dinner rolls into 5 inch circles. Cover with plastic wrap and let rest while preparing other ingredients. Remove wrap and place dough circles on sprayed baking sheets. Top with a spoonful of pizza sauce. Mix grated cheddar and mozzarella cheeses and sprinkle about 1/4 cup over sauce. Bake at 450 degrees F for 8-10 minutes. Remove from oven and decorate as desired. Place back in oven for 1-2 minutes. Watch closely so features made with cheese don’t melt too much. Spaghetti is dyed with black food coloring to make lines between teeth. Mozzarella cheese is painted with blue food coloring to make tear drops.